An international team of friends of five of us went to Cordillera Blanca of the Andes, Peru in July 2018 for 4 weeks of expedition. We climbed mountains up to 6000m via technical routes. It was a fantastic experience, even though we had many failures and it was a hard work. This is the record of our expedition. Sea stacks are often special or even dream objectives for rock climbers. The sharp spire soaring directly from roaring sea offers a great adventure. Why? First, the original and archtypal goal of climbing is to go high, perhaps up to the (locally) highest point, and preferably somewhere unreachable without climbing. In the UK, Napes Needle in the Lake District is the first recorded climbing in that respect, that is, climbing for the sake of it, rather than a means of training for bigger objectives like Himalaya. Sea stacks are of course an ideal objective, being independent and eye-catchingly distinctive. 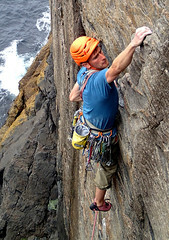 Second, sea cliffs usually add a dimension of excitement and often risk (or challenge) and difficulty to deal with in climbing, such as the tide. To climb above (possibly) crashing waves feels certainly exciting! Unlike most sea-cliff climbing, to top out to complete an ascent is not the end of the game. You will have to descend, usually by abseiling, and then perhaps to negotiate the sea and/or tide to get back to safety. Third, most sea stacks are off the beaten track. 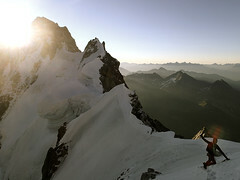 Climbers can enjoy the solitude, as well as the excitement due to its commitment. Not to mention, those pros serve at the same time as cons, or added risks. Sea stacks were formed as a stack with a good reason, that is, the rocks are not the most solid, even exacerbated by the harsh coastal climate. Famously, a British climber Paul Pritchard has suffered a serious injury due to a rock fall during his attempt of climbing The Totem Pole in Tasmania, which left him in haemiplegia. The challenge to climb a sea stack should not be underestimated. As a mountaineer, I love climbing peaks and pinnacles that are unreachable without climbing. In Peak District, where I learnt trad climbing, Rivelin Pinnacle was one of the big objectives in my early climbing career. In the Lake District, High Man in Pillar Rocks, which is technically the only mountain in England inaccessible without climbing, was once very high in my wish list. So was Inaccessible Pinnacle in Isle of Skye. Terrier's Tooth in Chair Ladder, Cornwall, which finishes at the top of a little pinnacle, was good to climb for the same reason, albeit the pinnacle is not very significant. Then sea stacks naturally draw my attention. However, I have climbed only one stack so far — The Souter in Scottish Border. It was good, and better than Rivelin Needle, Terrier's Tooth and alike. Nevertheless, I know it is nowhere close to the best that Britain, or practically Scotland, can offer. There are many sea stacks in the coast in Scotland; among those, the so-called Big Three are, Old Man of Hoy in Orkney, an Old Man of Stoer and Am Buachaille in the far north-west Highlands. 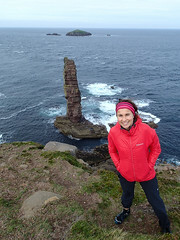 They are the biggest major sea stacks in British Isles, with Hoy being the tallest at 137m (n.b., see the note in the main article). The fact all of them are remote from major areas in Britain means the logistics are not easy for most people, including most Scots, let alone those from the south. The Scottish weather is anyway not renowned for being mild or dry to say the least, and the north-west coast tends to be the worst in Scotland. That means even if one makes everything else in the logistics right, it is fairly common they are turned down by the weather. As such, the level of commitment and effort is high in the Scottish sea-stack climbing. But the reward must be all the higher, if one suceeds. The southerner Michelle has never climbed any sea stacks before, and decided to come up north to attack sea stacks for a week in September with me. The plan is hopefully to climb the Big Three or a part of them, depending on the weather and our progress, all via the standard (easiest) routes. Most pitches being VS or below, which is within Michelle's leading grade, she would lead some pitches or maybe alternate leads. But if things get tough or serious, I would take the lead. Just 10 days before the week, I had taken a seriously bad fall, which put me on bed for a couple of days. Fortunately, I have recovered just enough to make it in time, with or hopefully without pain killers. The fun in mountains depend so much on the weather. We all know that, but despite uncertainty we must try. You may get a lot some year, and not much in another. In Chamonix I had the best in autumn 2010, and then the worst in summer 2014. When Rob interested me in alpine climbing in August in Chamonix, I wasn't so sure of what we can get done. The thing is, due to the climate change, it seems August has become increasingly unsuitable, particularly for snow and mixed alpine climbing in recent years. We nevertheless went for it, joined by our friend, Simon. It has turned out to be my best climbing trip to Chamonix. A dump of snow early in the season (which has even claimed some lives in early season due to an unusual amount of snow), followed by a quite stable sunny weather during our stay, offered us the arguably best conditions imaginable for August. Dolomites — allegedly one of the best trad-climbing venues in Europe. A meet by Bowline Climbing Club was held there in the end of this summer. I had a chance to participate it for a few days, then further climbed on after the meet, with another visiting friend of mine. Report of our first ascent of Angels and Demons (IV, 4), An Garbh Choire, Braeriach.